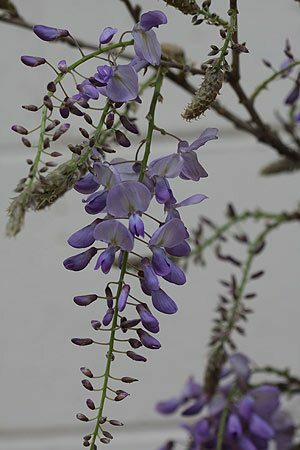 With both blue and white flowering varieties, Wisteria sinensis or Chinese Wisteria is a vigorous climbing plant that produces masses of flowers in spring. Reaching from 5m to 7m in height it is traditionally trained to grow on Pergolas or climbing frames. In Australia you will often see it growing attached to a verandah or even trained to grow along a fence. The flowers appear in early to mid spring hanging in long clusters, blue to mauve or white. Certainly the flowers are the main attraction, however the green foliage is attractive and can provide shade through the summer months. In autumn the foliage turns to a buttery yellow. Wisteria sinensis can also be trained as a standard, it can look stunning with the long new growth that carries the flowers hanging down. Heavy flowering with bright purple to blue flowers that hang in racemes to 35cm. A white flowering form, fragrant and a standout in the garden. This is a versatile and tough plant once established. It will grow in full sun to part shade, however flowering will be more prolific in full sun. Prepare the soil well before planting, dig in good amounts of well rotted compost and cow manure and ensure that drainage is good. Put a trellis, wires or climbing frame in place that is sturdy enough to hold the plant. Remember that new plants can take 3- 4 years to flower, so be patient. Pruning is carried out in winter, remove all growth that is not wanted, or is not a part of the main structure back to 3 buds from the main stem. After flowering a second pruning should take place. Simply remove any shoots that are not wanted, and then prune others back except for those that will form part of the structure of the plant. Flowering time – Spring to early summer, with flowers appearing on bare branches. Flower colour – Whites and Blues. Fertiliser – Top dress with compost and aged manure each year as Wisteria sinensis are heavy feeders. Wisteria sinensis is available for sale online from the following nurseries.